The day finally came where you had to move your loved one into a nursing home facility. You did all your research, asked all your friends, and looked at online reviews. You and your family chose what you thought was the perfect place for Mom. Mom moves in, and your family breathes a sigh of relief. Some of the time, that’s the end of the story. Mom gets great physical and mental attention, she enjoys and interacts with the staff and medical team, and she’s even made friends. But not all families are this lucky. Let’s examine some of the reasons for this. Baby Boomers are the largest generation in the history of the US. They are now increasing our population of senior citizens at a rapid pace. For this reason, caregivers, nursing homes, and assisted living facilities are feeling the strain of an increased resident load with immediate care needs. 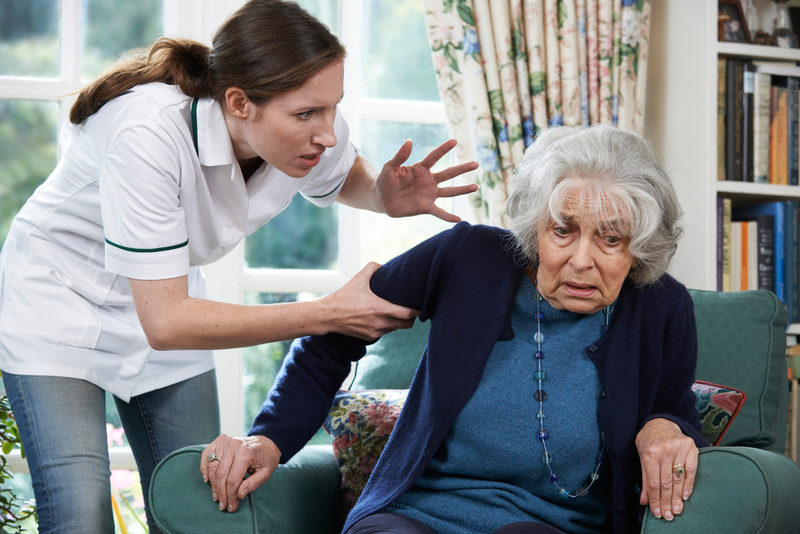 As a result of all of these factors, the Nursing Home Abuse organization estimates that as many as 5 MILLION of our elderly population are abused each year. Yes – this is a sobering, emotional, and anxiety-packed statistic. And it makes you wonder: how can you REALLY be sure that your loved one in a nursing home or assisted living facility doesn’t become part of this statistic? 1.Check with the Alabama Department of Public Health to see if your loved one’s facility has been cited for any violations of regulations that govern the facility. This is one of the easiest yet most often overlooked actions that family members can take when looking for the right facility for their loved ones. What you might not know is the ADPH has a scoring system for nursing homes, and if a nursing home drops below a certain score, it can be placed on probation, have its license to operate revoked or face other penalties. 2.Ask what the staff to resident ratio is. See how this compares to other facilities you’re considering. As we mentioned above, many nursing homes are struggling with staffing appropriately, and you want to make sure to choose a nursing home that makes an appropriate staff to resident ratio a priority. Be sure to ask for the licensed staff to resident ratio as well. 3.Specifically for dementia residents, you should know the obligation a facility has regarding whether your loved one is in the right type of facility (i.e. assisted living, specialty care, or nursing home). Did you know that physicians at these facilities are obligated to score dementia residents every 3 months to monitor whether the resident is in the right place. If the score indicates the resident needs a higher level of care, the facility is obligated to move to assist the family in moving the resident to a place that gives them the level of care they need. 2.Check to make sure your loved one isn’t losing weight. Insist on seeing weight charts and documentation about whether your loved one is eating properly and frequently. 3.Visit FREQUENTLY, and at different times of the day. That way, your arrival isn’t anticipated, and you’ll be more likely to get a true picture of the care they’re receiving. 4.If your loved one complains of a fall, there should be documentation on that. Ask what was done and check for signs of injury. 5.Look out for unexplained bruises on faces and necks. I’ve discovered my loved one is NOT being properly cared for in their nursing home. What should I do? Our best advice is to become VERY familiar with the facility administrator. MAKE NOISE. This is a scenario where the squeaky wheel gets the oil for sure. Most administrators want to provide quality care but may be limited by ownership’s decision to control costs. Bring concerns to the administrator’s attention. You may be empowering the administrator to convince the facility’s owner to hire more and better staff. Make sure the administrator and staff know you are on high alert. Show up frequently. Take photos if you see potential evidence of elder care neglect. Document conversations, and date them. I am not the type to be “sue-happy”- but how do I know when it’s time to involve an attorney? Other than these types of injuries and declines, any unexplained death should be investigated. If your loved one passes away without any specific cause, we strongly recommend that you request the physician to order an autopsy. An autopsy can let you know if there was an overmedication issue, death caused by a head injury, or death from sepsis, just as a few examples. It’s never an easy decision to move your elderly loved one into a nursing home. However, you can sleep better knowing there are many good ways to ensure your loved ones are getting the absolute best care possible. And if they’re NOT, take some of the actions we’ve outlined in this article to make sure your loved one is being cared for as lovingly and attentively as though they were living in YOUR home. At Riley & Jackson, we realize hiring a lawyer is an important, difficult, and emotional decision. Our attorneys will never rush you to make a decision. We offer a free consultation so that you have a chance to meet us and we have an opportunity to learn more about your case. For more information about our Birmingham Alabama law firm or to schedule an initial consultation with our attorneys, call 205-879-5000 or send us an e-mail via our website. We serve clients throughout the country.